that line. None of the railway staff employed on the train were injured, but 16 passengers and the have notified the Company of injuries sustained; none of these were however, of a serious nature. The buffer stops were displaced and considerably damaged ; the damage done to the rolling stock is given in the appendix. the wheels of the car. working blocks on all its wheels. All the brakes are reported as being in good order. he has not the power to turn it off if it applied by the driver. train entering the station does not actually obtain a view of the buffer stop until he is about l50 yards distant from them. at a point distant 123 yards from the buffer stops this changes to a slightly falling gradient of 1 in 818.
lowered. These signals are worked from the Brighton West signal-box, which is situated close to them. passed. There was assistant in my box at the time but it was myself who lowered the signals for the train. runs fast past my box but it ran about the same speed as usual on this occasion. saw a man alight from it about 50 yards from the buffer stops and he fell. I could not see from what part of the train he alighted. have not known of any previous difficulty in stopping one. speed that cars usually do when they enter the station. began to skid before the car reached the buffer stops. and put the hand brake on. When I put the hand brake on we were passing the West signal-box. She picked up her wheels again. them before. There was a ganger from Shoreham riding with me in the same compartment. I admit that this is against the rules. and ridden in the compartment as upon previous occasions. when we struck the buffer stops at about four or five miles an hour. I could not see the buffer stops from my cab on the engine. Just before the collision occurred I reversed my engine. I did all I could to assist my driver. believe the brakes were in good working order. There had been no trouble with them on that morning previous to the accident. When entering Brighton Station I was riding in the drivers compartment just before the train entered New England Tunnel. the wheels were skidding when we passed the West box. speed the train was going, but I could see that we were going to hit the buffer stops. a.m. 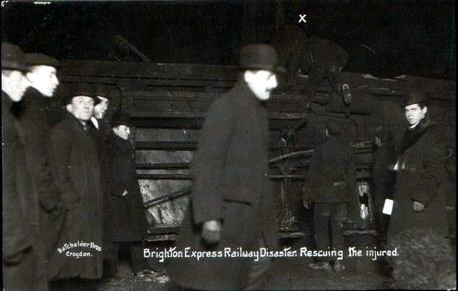 It finally left Shoreham at 6 am., and it was on its arrival at Brighton at 6.18 a.m. that this accident occurred. difference to the speed of the train, and he estimates his speed at the time of the collision at from four to five miles an hour. up to the very last. concur in stating that it passed their box at the usual speed of that car. The brakes of the train were tested immediately after the accident, and were found to be in excellent condition. difficulty in controlling the train when entering Brighton station thee-quarters-of-an-hour previously. the station that this collision must be attributed. engine is desirable, and the attention of the Company might be drawn to this point.